Valencia Hostel i Kairo, Egypten : Boka nu! All guest rooms at the Valencia Hotel feature satellite TV, a mini-bar,and elegant bathrooms. Some rooms also feature on downtown view. 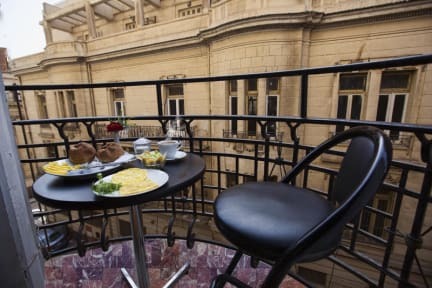 The Valencia Hotel serves,Meals are served indoors and al fresco. The hotel also has Restaurant and where drinks and light refreshments are available. The Egyptian Museum and The Nile River are just a 4-minute walk from the Valencia Hotel and within easy reach to the main train and bus stations. the downtown is a great choice for travelers interested in nightlife, restaurants and entertainment. Sit back & relax, plan your itineraries & catch up with your family & friends by logging onto our new optimized FREE WiFi Broadband Internet. Our rooms are equipped with private facilities . We have single, double and private dorms available and there are 41 rooms in total. airport transfer to the hotel is available . Egyptian Museum and The Nile RiverKhan El-Khalili Market.